The Cigar Inn on Manhattan's east side is alive, if otherwise unremarkable, for a Monday night. Some smokers glance at a Kansas basketball game. Others finger their phones endlessly. Still another tilts her head way back and looks up: she draws on a cigar ever so slowly and deliberately forces the smoke back out. Other couples compare smokes. But at one table a man smoking an Ashton laughs as he divulges something extraordinary about himself: "I had never written fiction, though some judges would argue with that." He is Ronald Balson, suddenly a best-selling author at age 71. And the judges he speaks of are not literary critics, but the type who dress in robes and before whom he once argued cases as a civil litigation attorney in Chicago. But six years ago he embarked upon a thriving writing career that started with—of all things—a self-published historical novel. Word of mouth attracted a publishing house, and his Once We Were Brothers, a story about an 82-year-old Polish Holocaust survivor hell bent on exposing a renowned Chicago philanthropist as a former Nazi SS officer and murderer, became an improbable New York Times best-seller. He followed with another best-seller, Saving Sophie, which depicts an accountant desperate to rescue his daughter from terrorist kidnappers. Now, his loyal fan base awaits a third: in September Karolina's Twins comes out. All told, he has spun three historical novels since he was 65. This litigator, who once defended an NBA star from a false charge of point-shaving, is now discussing his work with book clubs and dreaming of more to write. His Facebook page is a veritable bulletin board announcing meeting times for book signings and discussion groups. Balson appreciates his preternatural success. "Life is great," he reflects. "I get more than I'm entitled to." You hear broadcasters speak of athletes having a "game face." If there is a writer's equivalent, Balson doesn't own one. His smile is affectionate and collegial. His dress—a blazer and slacks—is relaxed. No studied or posed look is intended to make you ponder, "What deep thought is this author thinking?" Balson is five-foot-six and broad-chested. His heart, the undeniable source of his success, seems inversely proportionate to his stature. Asked when he decided to lead a literary life, Balson answers pithily: "There wasn't a date or a time or an event where I made a decision to lead a ‘literary life.' I just added writing books to my nonliterary life." But success didn't come overnight. For five years all he got were rejection letters. But he persisted. And his early difficulties in getting published reads like a book within a book, with its own backstory. Ron Balson lived in Chicago until the middle of grade school, when his family moved to the suburbs. "I had a good education," he recalls. "I went to a really good high school. I played a lot of golf. My mother sent me down to Tulane [in New Orleans] because she wanted me to be a doctor. I started out doing all these premed courses. I hated it." He was drawn to English and history and became a history major. "It probably set me up for writing historical fiction." That and being sports editor of the college newspaper. He then taught in the public school system in Chicago for seven years while attending DePaul University College of Law at night. In his legal career, he would assist on a memorable high-profile case decades before he got a sniff of literary fame. In 1986, he represented John "Hot Rod" Williams, a Tulane basketball star accused of point-shaving. Balson paints a picture of an inner-city athlete with little money placed in an environment of privileged students. Some of the players were approached by students to manipulate point spreads. Williams denied involvement, but Balson says his teammates who had been "flipped" by prosecutors fingered him. "Why Hot Rod?" he asks, his voice loud and a bit angry. "Because he was the star. He was all-SCC. He got the big contract with Cleveland. These other kids didn't get pro contracts. So they all testified against him and said it was Hot Rod. At the end of the day they couldn't prove the case," Balson says triumphantly. Across those 30 years Balson and his wife Monica raised eight children. "They are all successful in one way or another," he says. "Oh, how's your bracket?" Ron asks, referring to March Madness. His features Kansas, where three of his kids went to school. The Balsons' family life has filled with community involvement: They were Citizens of the Year in their Chicago suburb; Monica was homeowner's association president; they instituted community celebrations; he coached his kids in sports. To fulfill the next ambition in Balson's life he needed one more thing: a story. "I always wanted to write fiction," he says. "But I didn't find the right thing to be inspired about, until I was involved in a complex telecommunications case that took me to Poland. I took several weeks travelling around Poland. Poland's history, with its scars that are still there since the war, moved me at that point. The research for Once We Were Brothers took me over two years. Because the reader wants to know how the city is laid out, when the deportations occurred, where the jails were—it's all there in the research." The writing reflects the many facets of Balson: the lawyer, researcher and the teacher, who explained the finer points of jurisprudence to law students at the University of Chicago for 25 years. "Litigators write; we write motions and memoranda, we write arguments and appeals," he says. "Any successful trial lawyer knows that you have to paint an interesting story for the jury to follow." His books simmer with historical details that are sometimes placed in the mouths of his characters. The accuser in Once We Were Brothers neatly sums up how the tide turned for Hitler's Germany in the fall of 1942: "Up to that time, the German army had seemed unstoppable. Rommel's Afrika Korps was in command of North Africa and the German Sixth Army, using Romanian, Hungarian, and Italian divisions for support, was about to take Stalingrad. But...[Hitler] had overreached himself." Philosophical discussions emerge naturally as well. Asked if there is a life after death, the same character answers, "That's the jackpot question, isn't it?" and traces his positive belief to his religious studies: "Each time one of the Patriarchs dies—Isaac, Jacob, Aaron, and Moses—the Bible recites, ‘He was gathered to his people.' Those passages say to me that the essence of our loved ones still exists, and when we die we will be gathered to them." Balson admits to absorbing the work of Herman Wouk, the 100-year-old novelist who wrote the classic The Winds of War, and Leon Uris who lured his readers with remarkable story telling in historical tomes such as Exodus and Trinity. "They are craftsmen; I aspire to their brilliance in the feeblest of ways," he says. He writes slowly, rolling patience and a perfectionist's longing into one. If the words are not coming, he waits. And waits. "Sometimes I write all day just to get a couple of pages. On a good day, if the words are flowing, if the inspirations are hitting me and I'm in a groove, I can go seven or eight hours." The words must be just right. "I am very critical of my own writing," he says. "I want every sentence to be written just so." He compares the process to painting a picture: "You want the colors to be right." Balson also knows when to push back from the laptop. "Smoking is a break from your to-do list, a break from all the demands that are on your schedule all day long. 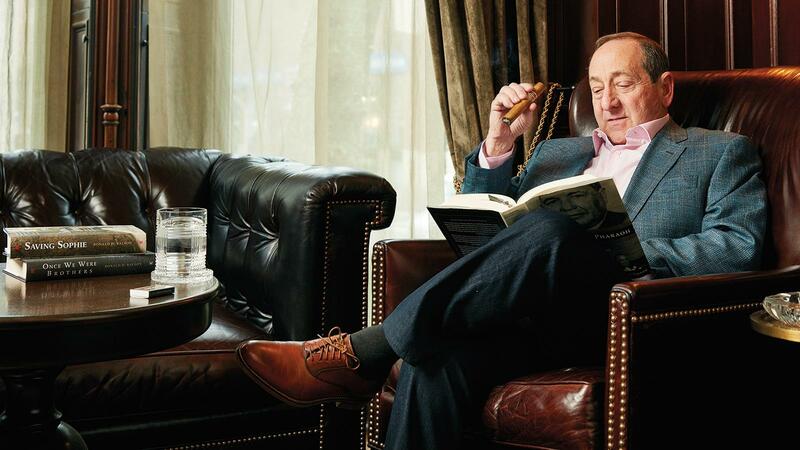 Just to take an hour or 45 minutes and sit there and read and have a drink and smoke a cigar—it kind of forces you to relax. "I like an Ashton," Balson says. Sitting up straight on a plush couch, the author lets the smoke of the Dominican cigar out slowly, savoring the taste. "It's a consistent, mild smoke. I'm not crazy about strong cigars—they leave me a little light-headed." Like his plunge in literature, there wasn't a set date for adopting cigars either. "I smoked because my grandfather smoked," Balson recalls with a trace of a Chicago accent. "He smoked all the time—in his house, in his car, everywhere. I just liked the aroma. I started in my 20s. I didn't have any money, so I smoked Antonio y Cleopatras." Later, while doing research in Israel on Saving Sophie, he discovered a cozy store named Freddie's Cigars and Wine on hotel row in Tel Aviv. There he also discovered Cuban cigars, specifically his first Trinidad. He pairs that with a Macallan Scotch. Besides cigars, he has another ally. "My wife is the sounding board," he relates. "She is the first editor. I write 20 to 30 pages and let her see it. She is my typical reader: not an English teacher, nor a writer herself. But she can be very critical. She might say, ‘This paragraph is confusing to me.' And I go back and look at it and she may be right." The dedication of his book reads, "To my wife, Monica, with whom I dance through life." Some ask if writing is lonely. He replies that he spends time with his characters, even talks with them. A story outline is not the starting point; his characters are. The lawyer Katherine Lockhart and private investigator Liam Taggart from his first novel are essentially composites of people he's met over 43 years of lawyering. "The story is about the characters. If you can create characters that people care about, that people identify with, then you can take them back into that period of time. My characters are real people. My characters are as real to me as you are sitting there. Only I know them better." On his desk he keeps a quote from Joan Didion, aspiring to its sentiment: "I am a writer. Imagining what someone will say or do comes to me as naturally as breathing." The pace of Balson's writing is also crucial. A series of conflicts fuels the reader's interest and becomes a subtext of the story. The prose never bogs down with lengthy sentences or baffling jargon. It helps immeasurably that he writes in brief, user-friendly chapters. "People have said that my writing is very adaptable to a screenplay." An upstart production company, Cool People Productions, acquired the film rights. "There is a lot of dialogue and there are short scenes. Especially in a book like Once We Were Brothers, which goes back and forth between the present [in Chicago] and the past [in Poland]." As brisk and thrilling as the book is, it almost didn't get published. Balson worked on it from 2005 to 2010 but garnered little interest at a time when he was heavily involved working for a big firm with a 300-person practice. The demands of the practice took a lot of time. Meanwhile, the book was getting rejected. "I still don't know to this day how many people ever read sample chapters or query letters," he says. "Publishers have pre-printed rejection post cards that say ‘Doesn't suit our needs at this time.' My favorite was ‘I liked it but I didn't love it.' "
Did he doubt himself? "Yes because rejection is like a body punch. You can take a few of them, but they are cumulative. They take their toll. If you get rejected dozens of times you start to say, ‘They're right and I'm wrong.' " But rejection didn't stop him. He spent more than $10,000 to self-publish the book with Berwick Court Publishing, a firm started by his son, Matt. "After we kept getting rejected, I put the book on Amazon. I didn't do any marketing. I wouldn't know today what to do. My son Matt was my marketing arm. We got into Barnes & Noble and he got us through the distributors Baker & Taylor and Ingram." Then word of mouth kick-started sales. "You have to ask yourself, ‘Why did I read the last book I read?' It was probably because someone said to you, ‘I read a great book.' Or you asked, ‘I finished a book, got any recommendations?' All of a sudden in September of 2011 we sold 1,000 books," says Balson. "And the next month 3,000, and the next month 5,000. Soon we were over 100,000. The book sold 125,000 copies before St. Martin's discovered it." Success is a fuse that gets lit in the oddest of ways. A most unlikely occasion led St. Martin's to adopt Balson's book. "Kathy Huck [an editor with St. Martin's Press] was home for Christmas when her aunt gave her the book and said, ‘I love this book and my friends are all reading it. You should read it,' " Balson relates. Huck resisted, but her aunt convinced her to consider the book. While she was reading it on a train a conductor approached her, and he stopped and said, "That's a really good book." When she asked how he knew that, he told her that a lot of people on the train were reading it. "She looked me up and found me," Balson says. "We talked and she brought me into St. Martin's Press." Since St. Martin's took it on, running an enormous ad in The New York Times for the October, 2013 publication date, sales have climbed to the 500,000 mark. In Italy it was published as I Only Want to Be With You with a cover stressing the romantic angle by depicting a boy and a girl standing in water before mountains. Now his fan base wants to know what is next in the life of characters Liam and Katherine. Will they get married and have children? "They want to know that, especially my female readers," he says. "I heard that 80 percent of fiction is read by women. When I first started writing Once We Were Brothers I did not envision the lawyer being a female. I didn't envision her having a relationship with the private investigator, but then that came to me." Even those not part of his fan base are drawn in by his characters. Readers often root for a just conclusion. "Don't you think you have to do that in a novel?" Ron asks. "Don't you think that you have to have something for the reader to root for and then hope it happens? It's almost like going for the baseball game. You root for someone. Don't you think a reader wants to have some skin in the game?" It was during his Once We Were Brothers book tour that Balson was introduced to several survivors of World War II concentration camps. The story of one courageous woman, Faye, who grew up in Poland and survived Auschwitz, became the basis for Karolina's Twins. "I have a personal connection to each one of my novels. In Saving Sophie, the protagonist, an accountant Jack Sommers, manages at a commercial closing to divert by a fraudulent wire transfer $88 million. Well, I was at a closing like that—a $300 million closing. It occurred to me as I was sitting there, ‘Wow, what if I could get my opponent here (the other lawyer) to sign off on a phony transfer.' Of course, we would both have to disappear and live somewhere else for the rest of our lives! But if we could do it, and if the timing was right—get it out late in the day—I think we could do it. "I've been to Israel several times, so I know about Palestinian-Israeli disputes. I know about people who lived in the West Bank—I've been to the homes of the people who live in Hebron. We had pizza sitting under the Sukkah [or tent] in Hebron during the Jewish holiday of Sukkot. I have represented Russians who have an in to the Russian community. So all of those things in one way or another gave me material for a plotline." Ron has one more story to tell. "There's a guy I buy my stereo equipment from in one of the Northern suburbs. I thought he was from Eastern Europe, and I thought I would bring him a copy of Once We Were Brothers. I signed it over to him and said ‘Here, I hope you enjoy it.' Then he calls me and says, ‘I want you to come over and talk to me.' He says, ‘Well, I have to tell you that I was hidden by a family during the war, outside Warsaw. A Christian family hid my mother and I—when we pretended to be Christian during the war—and then we escaped to France.' In his room he had dozens of books about the Holocaust, mostly history books. ‘One thing I love about your book,' he said, ‘is that you can read a history book. You can take a class on World War II. You can read about the Holocaust. But at the end of the book there are just a lot of facts in your mind that don't stay with you. But when you wrap it up in a story with individuals, then it sticks with you. That's the best way to teach history.' "
That truth is self-evident when you read Once We Were Brothers. Kenneth Shouler is a philosophy professor at the County College of Morris and is a frequent contributor to Cigar Aficionado.